Going with the flow of nature is such a natural choice when it comes to gardening. Yet many of us were brought up in a tradition where gardens are controlled and orderly spaces. I was delighted to read Eliza Waters recent post titled Lazy Gardening in which she celebrates gardening for wildlife and “embracing a messy garden”. For me a “messy” garden is diverse, interesting, full of surprises and rich in providing food and shelter for a variety of life. And it is relatively easy to grow plants that are indigenous, as they are well-adapted to local conditions and provide for local insects, birds and other creatures, and by choosing to grow local plants we add to biodiversity too. In her post Eliza provides a link to a Pledge to be a lazy gardener from Yardmap and Habitat Network, attached to Cornell Lab for Ornithology in the United States. Pledging not to clean up the garden provides so much, simply by doing less. 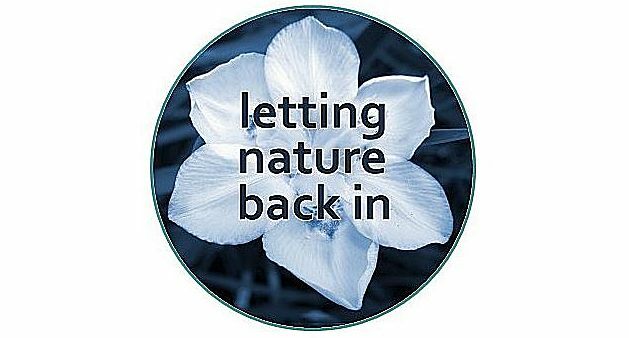 So leave the leaves, leave flowers and grasses to go to seed, leave brush piles and dead trees, avoid using chemicals in the garden, and benefit valuable pollinators and provide food, nesting materials and refuge for many other wild creatures too. For those of us lucky enough to have gardens – how nice to know that a relaxed approach is not only more nurturing for us, but benefits wildlife too! And in my view a natural garden is infinitely more interesting and enjoyable than a well-manicured one. Interesting post. I read the blog post you were referencing and I had just thought about the idea two weeks ago. I am glad that there is a movement as well! Thanks so much for your comment. I apologise for the delay in responding, but have had (and am still having) problems with Internet connectivity. I wholeheartedly agree. I would do away with the lawn if it was just me, and I know the dogs would not mind in the least. But I do not live alone and hell hath no fury and all that! My grandfather had the right idea: A tiny postage stamp size piece of lawn outside the kitchen door with a garden bench and backed by one of his sheds. My grandmother would sit and feed her tame blackbird. And grandad had an old fashioned push mower. Ten minutes and the lawn was done. The rest of the garden was used for vegetables ( and a few roses) – they lived through the war so growing one’s own food was practically mandatory. Composting and wotnot was essential. While not essentially wild, it certainly encouraged wild life! I am slowly but surely planting out as many indigenous flora as I can. And from the variety of species that visit these days it seems to be paying off. The only problem of leaving things alone are the invasive specie, including non local weeds. One has to be ever vigilant in this regard. Nice to see you have Manninkins. They are an absolute delight. I also have the purple plant you have featured at our spot. Do you by any chance know its name? Hi Ark – your grandparents garden sounds similar to the garden my grandparents had in Herefordshire. Amazing how productive those veggie gardens were, but they did require daily work to be so. I agree about the lawn. We are reducing the size of ours very gradually by planting up shrubby areas and letting some corners get “seedy” but will always have some lawn I should think. At least the hadedas and thrushes like it!! I agree that the live and let live approach has its limits when it comes to invasive plants, which we do pull up, Leaving the leaves does help control some invasives but only up to a point. unfortunately. I also love Mannikins and we have a small, wary group that visits quite often. It is great that so many of us are enjoying indigenous plants along with the wildlife that they attract. Oh, I completely agree! I only wish my neighbors were a little more understanding! LoveIy post, I’ve been an advocate of wild spaces in gardens for years, so much more interesting. I watched a TV programme recently where they compared species diversity in three gardens of houses in the same road, a traditional formal one,a totally wild one and one that was part formal and part wild. It was the mixed one that came out best with significantly more species of fauna than either of the other two, so the ‘wild around the edges’ approach is surely the way to go for the benefit of all. Thanks for the interesting comment Theresa. I should think that most people who favour a more natural style of gardening do not have a purist approach, and will end up with a diversity of plantings. Often though, indigenous plants (which are relatively easy to grow) are disregarded rather than enjoyed, and even in many plant nurseries are likely to be relegated to a small corner. Hopefully, that is changing. Oh yes,give me a wild garden every time. I think they’re not necessarily easier to manage, particularly if they’re small, but so much more rewarding. We are tenants, so the garden isn’t our shout, but it’s very large, and quite a satisfactory mix of formal, and wild at the edges. Wild at the edges sounds great! What can I say but Hear! Hear! I too read Eliza’s post and felt my own approach to gardening has been vindicated – I am all for the naturalisation of gardens, despite the comments from more traditional gardeners who feel mine is ‘messy’. The birdlife alone is worth the (lack of) effort as are other visitors such as butterflies, bees, tortoises and the odd mongoose. Thanks Anne. It is so nice to discover that more people the world over are becoming more aware of the benefits of wildlife-friendly gardening and a more natural approach using indigenous plants. You are so right that the many birds and other visitors make it so rewarding. All hail the messy garden and all who thrive in it! I love a wild garden too! Indigenous and water-wise is the way to go for sure. For sure! And I’m so glad you also love a wild garden. Visiting really wild places is so inspirational and can show us how our gardening preferences might become more indigenous, natural and wildlife friendly. Nice post, thanks for the mention and keeping the momentum going! Thanks Eliza and thanks for the inspiration. It is so nice to know there is a growing momentum for more wildlife-friendly practices. Hopefully it all adds up to providing corridors and sanctuaries for wildlife that is under so much pressure.